Estrangement reveals a haunting cinematic space that brings together works by four international artists within which apparitions of places and figures are imagined and followed. An almost beguiling word estrangement promises images of escape, of being fundamentally displaced from the world. To seize this moment divorced from the real, the works featured in the exhibition populate the uncanny space of the moving image with a range of characters and situations. From a remote controlled camera roving about a landscape, to a group of men standing uncertainly amongst ruins, the viewer is invited to “be carried along solely by the looks of the world”. * In each of the evocative video pieces different and intuitive aspects of estrangement are captured and the quiet wonder of being apart is revealed. In turns unsettling and ambiguous, the works by Fatma Bucak, Larisa Daiga, Evariste Maïga and Samuel Williams call upon the familiar and unfamiliar, the real and the illusory and bring to the Cooper Gallery rich visions of fragmentary landscapes and dissonant solitudes. Each of the artists invited to exhibit in Estrangement have an emerging but exciting profile on the international scene. Fatma Bucak has shown her works across Europe and in 2012 she won The Worshipful Company of Painter-Stainers Prize with her video performance Blessed are you who come, which will be seen in Estrangement at the Cooper Gallery. Larisa Daiga’s cross-disciplinary manoeuver between ceramic and filmmaking led to an Eduardo Paolozzi travel grant for her to research in Japan in 2011 and to her current residency at BrickHouse Ceramic Art Center in New York City. Selected for the Bloomberg New Contemporaries 2011 Samuel Williams works primarily with sculpture and video and has been critically acclaimed for his series of Twenty Second Sculptures. Evariste Maïga’s work draws attention to the question of how do we manage to create when confronted by the unknown. This is illustrated in his two films included in Estrangement, which have also been selected for the Bloomberg New Contemporaries 2012. * Martin Heidegger, Being and Time. Fatma Bucak was born in Iskenderun, Turkey, in 1982 and lives and works between London, Istanbul and Turin. After her BA in Philosophy at Istanbul University, she moved to Italy where she graduated in Graphics from the Albertina Academy of Fine Arts and in Photography from the European Institute of Design. She completed her MA in Photography at the Royal College of Art in 2012. In 2009 she had her solo exhibition Melancholia I, at the Zandra Rhodes Gallery, Rochester, UK. She had her second solo exhibition Daughter of Man, in 2011 at the Alberto Peola Arte Contemporanea, Turin. Bucak’s documentary film Almost Married was broadcasted to several European TV channels and selected, among others, for the 2011 International Festival of Non-fiction Film and Media at MoMA, New York and IDFA - International Documentary Film Festival 2010, Amsterdam. In 2012 Bucak won The Worshipful Company of Painter-Stainers Prize with her video performance Blessed are you who come in London and completed the residency programme CNC - DAEI Film Residency in France. In 2012 she was selected for the Catlin Guide - a limited edition book profiling the 40 most promising new art graduates in the UK and exhibited in the group show, Dress Code, Contemporary Art Platform Gallery Space, Kuwait. Bucak’s work is strongly influenced by her own biographical history referencing observations from reality and constructed fictional, mythological aspects. Silent landscapes home to ancient Biblical and Koranic stories, an unconscious sense of guilt and the peremptory presence of a feminine person are all metaphors that Bucak reinterprets in her work; she instils these archetypes with new possible meanings and interpretations, in a shift back and forth from East to West. Blessed are you who come, the video performance to be exhibited as part of Estrangement, is a confrontation between the artist as a woman and 12 old men who become the performers and the audience at the same time. Filmed at a border village, the work reflects and questions the cultural displacement between people of different cultural identities. Larisa Daiga was born in Indianapolis, USA, in 1981. She pursued an MA in Ceramics from the Royal College of Art graduating in 2012. In 2011 she was awarded the Eduardo Paolozzi travel grant and travelled to Japan, which greatly influenced the direction of her work and created a new focus to really push the boundaries of what clay as a material can do and in which discipline it can reside. She is the current Resident Artist at BrickHouse Ceramic Art Center in New York City, where she lives and works. Evariste Maïga was born in Lome, Togo, in 1980 and brought up in Switzerland. After completing a BA Visual Communication at the University of Art and Design, Geneva, he graduated from Master of Fine Art at Goldsmiths in London in 2012. 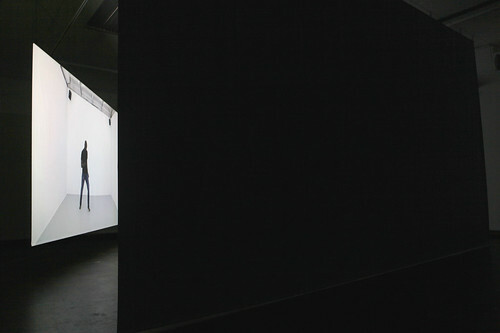 In 2012 Maïga’s work was selected for Bloomberg New Contemporaries. Maïga currently lives and works in London and Geneva. Sidestepping questions of formal representation, Evariste Maïga produces physical objects that seek to express ideas. Developed through improvisation and focused on an encounter with the unknown, Maïga’s confrontational practice challenges the praxis of creativity. In a recent work, Improvisation, Pain and Joy, Maïga attempts to match familiar physical movements, learned during his life, to an unfamiliar soundtrack of electronic music. This matching of a certain cultural knowledge is also explored in (...) Not Standing Still in which Maïga isolates a simple gesture, then repeats tirelessly to a hypnotic tune. Samuel Williams is a British artist. After completing a BA Critical Fine Art Practice at the University of Brighton he graduated with an MA in Fine Art Sculpture from the Royal College of Art in 2011. Williams undertook a residency at Kyoto City University of Arts in Japan in 2010 and he has exhibited in Germany, Russia and the USA as well as in the UK. In 2011 he had a solo show at Inova, Milwaukee, USA and his work was selected for Bloomberg New Contemporaries. Cooper Gallery is located in the Crawford Building, DJCAD.